Another face jug from Face Jugs: Art and Ritual in 19th-Century South Carolina. My good friend Mike Mikulay did another excellent job of designing this exhibition for the Chipstone Foundation. The wall of face jugs is especially impressive. 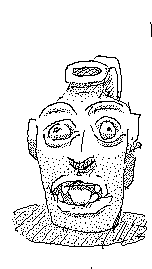 I tried shading this drawing by stippling it in MS Paint, but it kind of looks like the face jug has 5 o’clock shadow. I went to the Milwaukee Public Museum on Monday with Ariana and we drew some of the stuffed animals. 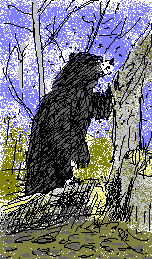 This bear was licking honey from a broken tree while the bees swarmed around on their mono-filament tethers. 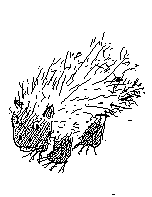 The black and white drawing I did on the PDA seemed a bit of a mess so I tried to clarify things by adding color with MS Paint. Ariana did two nice drawings on her ipad. She’s posted them on the On Location Milwaukee blog. 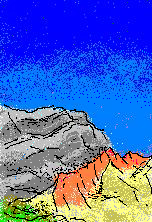 I used Microsoft Paint to colorize this digital drawing from red Rock Canyon. 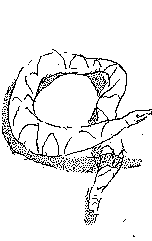 I know there are more sophisticated programs out there but Paint seemed like an appropriate program to use on a PNG that’s 152 x 222 pixels in size.